Platinum Pass! 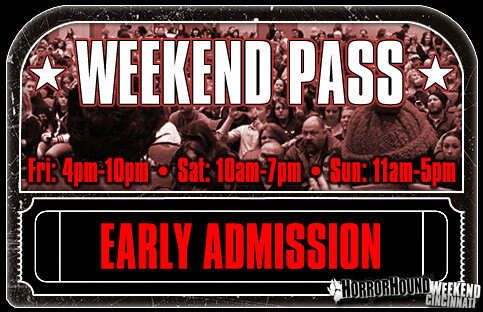 This ticket grants holder admission into HorrorHound Weekend during normal business hours ALL WEEKEND – March 23-25th, 2018 – with one-hour early admission into the event Friday and Saturday! (Early Admission Hours: Friday: 4pm-10pm, Saturday: 10am-7pm, Sunday: 11am-5pm). Ticket grants admission into the convention center with access to the vendor, celebrity, tattoo room, Q&A panels, and the HorrorHound Film Fest. Additionally, Platinum Pass Holder will receive a special line-cut pass which will be good for one line cut per EACH line-cut accessible guests (including Ron Perlman, Michael Rooker, Gaten Matarazzo, Sadie Sink, Tommy Flanagan, David Arquette, Brad Dourif, Jennifer Carpenter, Ross Marquand, and more TBA). *Upwards of a dozen different line-cuts total. *Hotel reservation information will be emailed no later than one month prior to event. Hotel will be good for a two night stay (Friday-Sunday). Additional nights can be added at ticket-holders expense. Reservation name(s) can be changed once final reservation information is emailed to ticket buyer. VIP Ticket! 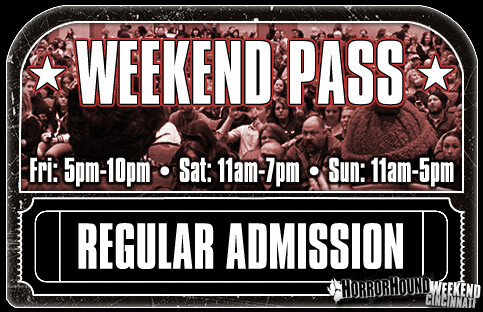 This ticket grants holder admission into HorrorHound Weekend during normal business hours ALL WEEKEND – March 23-25th, 2018 – with one-hour early admission to the event Friday and Saturday! (Early Admission Hours: Friday: 4pm-10pm, Saturday: 10am-7pm, Sunday: 11am-5pm). Ticket grants admission into the convention center with access to the vendor, celebrity, tattoo room, Q&A panels, and the HorrorHound Film Fest. Additionally, VIP will receive a special line-cut pass which will be good for one line cut per selected guests (good for up to three guest line cuts. Line cut guest options include Ron Perlman, Michael Rooker, Jennifer Carpenter, Ross Marquand, and more names TBA). 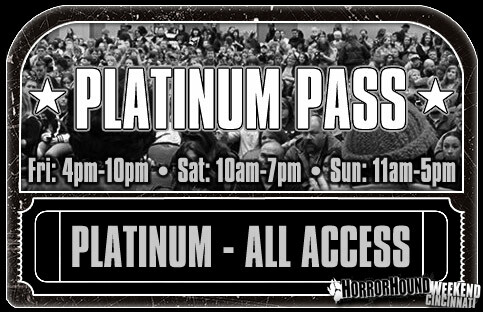 Admission into HorrorHound Weekend during normal business hours ALL WEEKEND – March 23-25th, 2018 – with one-hour early admission to the event Friday and Saturday! (Early Admission Hours: Friday: 4pm-10pm, Saturday: 10am-7pm, Sunday: 11am-5pm). Ticket grants admission into the convention center with access to the vendor, celebrity, tattoo room, Q&A panels, and the HorrorHound Film Fest. Admission into HorrorHound Weekend during normal business hours ALL WEEKEND – March 23-25th, 2018 (Hours: Friday: 5pm-10pm, Saturday: 11am-7pm, Sunday: 11am-5pm). Ticket grants admission into the convention center with access to the vendor, celebrity, tattoo room, Q&A panels, and the HorrorHound Film Fest. 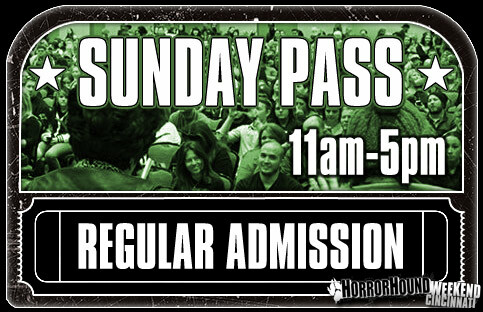 Admission into HorrorHound Weekend during normal business hours on SUNDAY, March 25th, 2018 (Hours: 11am-5pm). Ticket grants admission into the convention center with access to the vendor, celebrity, tattoo room, Q&A panels, and the HorrorHound Film Fest. 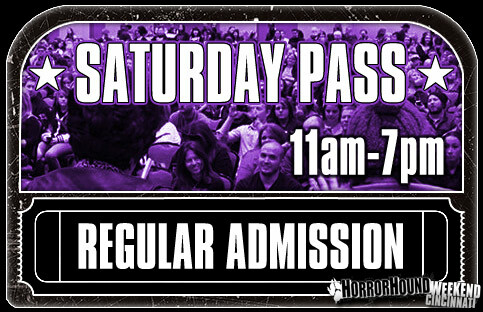 Admission into HorrorHound Weekend during normal business hours on SATURDAY, March 24th, 2018 (Hours: 11am-7pm). Ticket grants admission into the convention center with access to the vendor, celebrity, tattoo room, Q&A panels, and the HorrorHound Film Fest. 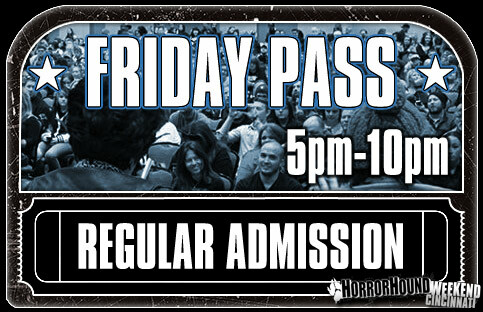 Admission into HorrorHound Weekend during normal business hours on FRIDAY, March 23th, 2018 (Hours: 5pm-10pm). Ticket grants admission into the convention center with access to the vendor, celebrity, tattoo room, Q&A panels, and the HorrorHound Film Fest. Please join HorrorHound for an Evening with Henry Rollins: spoken word and comedy. Event is extremely limited and expected to sell out. In describing Henry Rollins, the tendency is to try to squeeze as many labels as possible into a single sentence. "Rollins is many things," says the Washington Post, "diatribist, confessor, provocateur, humorist, even motivational speaker…his is an enthusiastic and engaging chatter." Entertainment Weekly's list includes "Punk-rock icon. Spoken word poet. Actor. Author. DJ. Is there anything this guy can't do?" TV Guide has more concisely called him a "Renaissance Man" – but if Henry Rollins could be reduced to a single word that word would undoubtedly be "workaholic. "For better than a quarter century, Rollins has toured the world as a spoken word artist, as front-man for both Rollins Band and Black Flag and – without a microphone – as a solitary traveler with insatiable curiosity bypassing the resorts in favor of places like Siberia, Senegal, Burma and Bangladesh.When he's not living out of a backpack, Rollins is constantly at work as an actor, radio DJ, author of more than 25 books, and running his publishing company and record label 2.13.61. Henry currently hosts a weekly radio show on LA's renowned NPR affiliate KCRW, is a regular columnist for LA Weekly and Rolling Stone Australia. In recent years has hosted several TV shows for National Geographic, including 2012's three-part series Animal Underworld with Henry Rollins. *Times are tentative and subject to minor changes. In any case of adjustments, any alterations will be clearly posted on www.horrorhoundweekend.com. **Admission into An Evening with Henry Rollins is included with the purchase of VIP/Platinum tickets (VIP/Platinum pass holders do not need to purchase tickets). Special Platinum Seating will be held and made available to Platinum Pass holders. VIP ticket holders will be allowed entry prior to regular ticket holders (general admission). All seating is first come, first serve in this order. Front-of-room seats will not be held for VIP ticket holders. To utilize VIP early-entry seating, VIP ticket holders must arrive to Q&A panel/event room at the Sharonville Convention Center prior to doors opening. 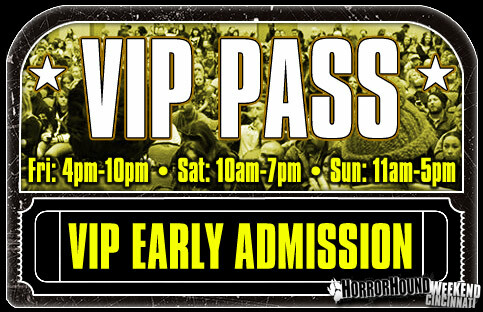 ***A ticket to this event doesn’t grant you access to HorrorHound Weekend. Additional HHW ticket purchases are necessary. 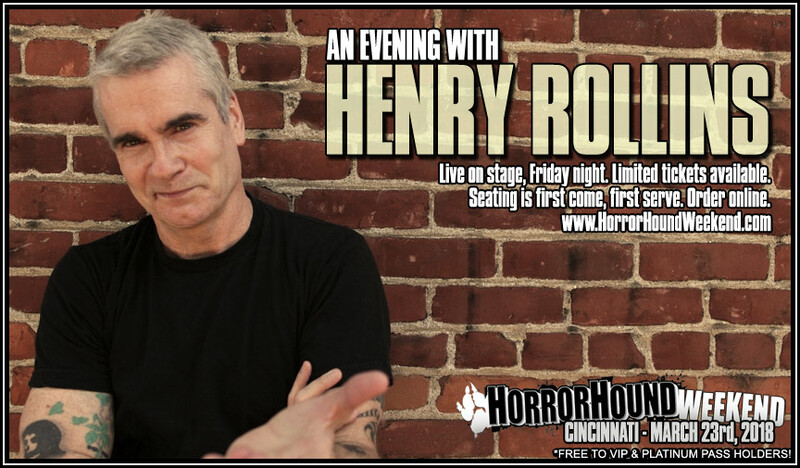 Such is a ticket to HorrorHound Weekend does not grant you access to An Evening With Henry Rollins. No one under 16 will be admitted. NOTICE: Free VIP admission is only valid for VIP tickets sold specifically for this HHW 3/18 event. Any ticket holders utilizing a VIP ticket purchased prior to 11/17 will not receive a free ticket into the Rollins event, and are subject to purchasing separate Henry Rollins ticket(s).